Kathmandu, Nepal (CNN) - Thirteen-year-old Jordan Romero is climbing Mount Everest, the world's highest peak, not only for himself but to inspire more young people to get outdoors. "Obese children are the future of America the way things are going," he tells CNN in Kathmandu Friday as he prepared to leave for the mountain on Sunday. "I am hoping to change that by doing what I do - climbing and motivational speaking. I want to motivate children and inspire them to get outdoors." If he is successful, Jordan will be the youngest person to get to the top of Everest's summit, 29,028 feet above sea level. With a smile he is quick to add, "I am doing this a little for myself too, to do something big." Because he has already climbed five of the seven highest peaks on seven continents, known as the Seven Summits, there is good chance of success. But he is realistic. "This could be first of many attempts," he says. "But I am determined to do it if it takes two weeks or two years." Having a very encouraging father and stepmom, who have gone around the world participating in climbing expeditions and competing in endurance racing competitions, certainly helps. "This is not an isolated vacation," says Paul Romero. "This is a lifestyle. We travel everywhere and climb together." 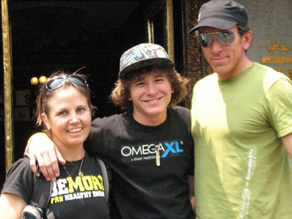 The family started tackling the Seven Summits in the summer of 2005. Jordan was just nine when they climbed the 19,341 feet to the peak of Mount Kilimanjaro. Since there is a debate about whether the tallest mountain in Oceania is Kosciuszko in mainland Australia or Carstensz Pyramid in Indonesia, Jordan and his family climbed both. Wow! He is ambitious. Good on him and what he is trying to do. Hope the climb goes well for him and he achieves his goals. Good Luck! A lot of people left their lives in the Himalaya trying to do the same. Perhaps it would be a great idea to think this over once more, he is a bit young to die. Sorry, I didn't take in his age initially. Did not realise he is only 13 years old. That is a bit too young to be taking on Mt Everest. Are there laws against children doing these types of things, I wonder? Sounds like he has climbed quite a few mountains though and this is the ultimate. That record is beckoning too it seems. Go Jordan, Paul and Karen! Jordan is my nephew. They have all worked very hard to get to this point. Jordan may be only 13 years old but he is not inexperienced. Paul & Karen are veteran Adventure Racers with years of experience to help make this summit climb a success. Paul is an EMT with the kind of medical training you want on any expedition. They have an excellent chance to do this. But, safety first and foremost. Go Jordan! Paul & Karen have years of experience in Adventure Racing and other sports. Jordan has been training for this since he was nine years old. If any 13 year old has a chance to make it to the summit of Mt. Everest, it is Jordan. All of them have a great deal of experience and expertise including Paul's medical training as an EMT. They want to make this summit climb but safety first. Jordan has climbed very technically difficult mountains. He is not an amateur.